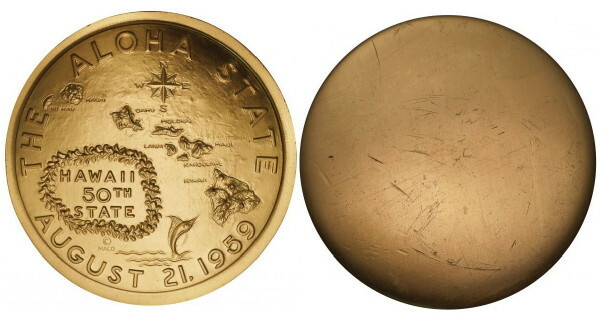 Medal 2: First Strike of die onto planchet (no collar is used in high relief striking). Medal details is coarse and lacks the fine details. NII HAU error is present. 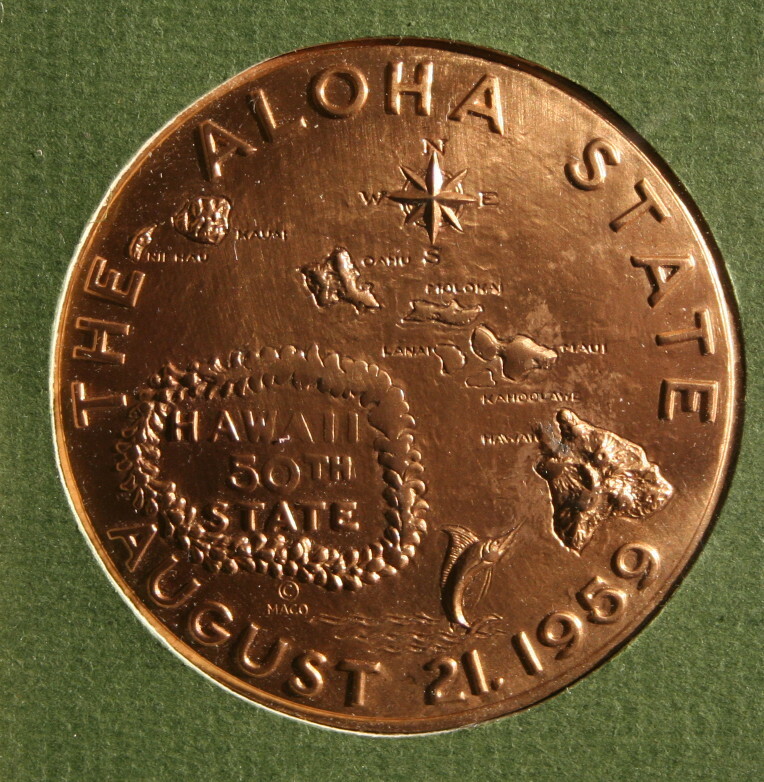 Medal is bright bronze and untrimmed (extra metal beyond the rim). Medal is NOT uniface. Medal 3: Second Strike of die onto coarse medal. Metal flow extends outward beyond the medal’s rim. Details are becoming stronger. NII HAU error is present. Medal is bright bronze and untrimmed . Medal is NOT uniface. Medal 4: Third Strike of die onto the medal. Medal flow extends outward and high relief detail are bold. NII HAU error is present. Medal is bright bronze and untrimmed. Medal is NOT uniface. Medal 5: Completed Medal with Obverse displayed. Antique oxidation performed previously (to highlight the high relief design elements). NIIHAU error is not present. Medal 6: Completed Medal with Reverse displayed. Antique oxidation performed previously (to highlight the high relief design elements). I do not dare to open the plaque I have in my collection at this time. In all, there are 6 new un-cataloged medals (I’m working on a catalog numbering scheme for these medals. Third Strike (image taken from a set that was up for auction with a major auction house). The plaque is thin (5/16 inch). The quality is impeccable and the workmanship outstanding. It is also made of layered archivable materials. I believe this plaque was used to promote the sales of the medal. Why? 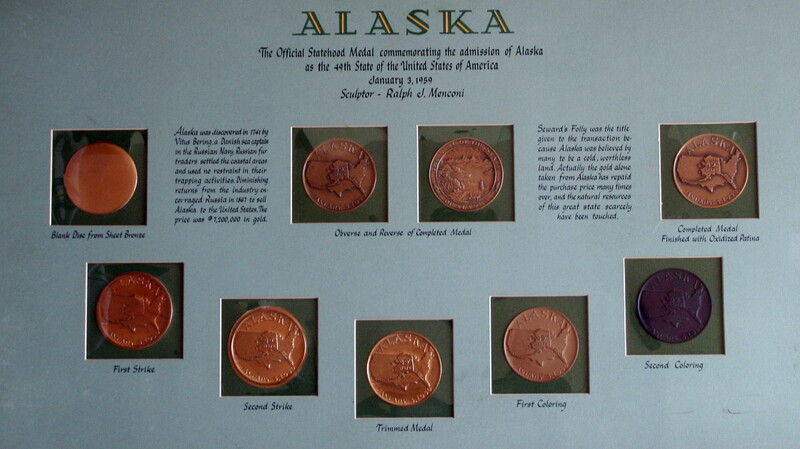 I also have the matching Alaska Official Statehood progression set with 9 medals. The differences is the inclusion of the coloring steps, added a trimmed medal, and the removal of the 3rd strike. I have not seen another Alaska set as this one. The set is duplicated in workmanship and quality. 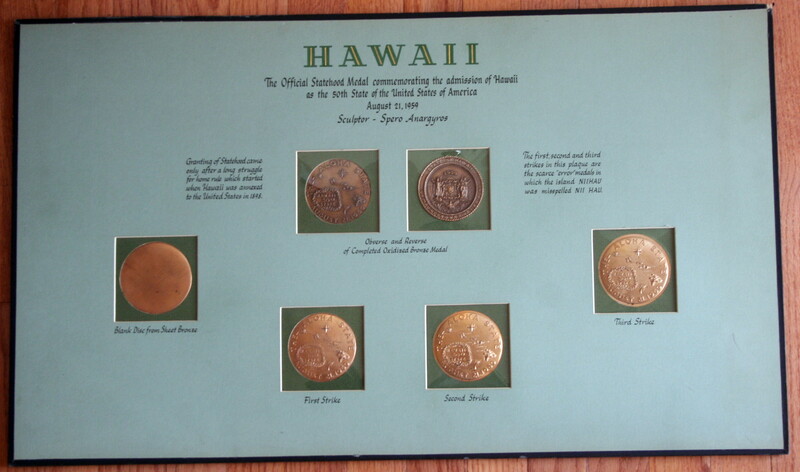 I have concluded that both sets were treated as place cards and placed on display stands at trade shows or show rooms to promote the Alaska and Hawaii Official Statehood medals .